There are obviously both good and bad people in journalism, and there are good and bad publishers. And, generally speaking, there are far more good people in journalism than bad ones. Pretty much every single journalist and editor that I know is both highly skilled, ethical and tolerant people. Journalists who, just like you and me, get angry when they see intolerance happening around them. So, it's weird that the media industry has a massive cultural problem around racism. Both in terms of racial racism, ethnic racism, and gender racism. Let me give you just one simple example. What happened (from the looks of this) was that we six young kids between 12 and 16 had assaulted an adult couple, in an apparent attempted robbery, and because of that, our politicians (and the media) went into populistic overdrive to condemn that it happened. But they didn't stop there, they also turned it into a racist and intolerant agenda, demanding that young asylum seekers should not be allowed to go out at night. Why is this racist, you ask? Well, let me change just one tiny thing in this headline. By simply changing 'asylum seekers' to 'blacks', you very easily see just how racist this is. You cannot look at the actions of a few individuals and then use that to discriminate against an entire population group. For instance, in my country, a few of our politicians have been caught drunk driving, which in a few isolated cases resulted in them crashing their cars. So, using the same reasoning, should all the politicians not be allowed to drive? But this article isn't really about the politics. I'm not a political analyst (or activist). I'm a media analyst. So let's talk about the role of the media. The problem that we have here is a combination of several things. I think we can all agree that the role of journalism is, in part, to represent reality in our focus, to make sure people are aware of that reality once they have finished reading a story, and also to protect the public from being misled. At least, this is how I would define it. And this is true regardless if we are talking about a newspaper covering crime and politics, or if we are publishing a fitness magazine for people at home. If I read a story about fitness, that story should be equally based on reality. Meaning that if the story claims that something is healthy for me to do, we have a journalistic responsibility to make sure that is true. The problem is that, in journalism, we have developed a culture that fundamentally violates this. Because instead of focus on reality, we are increasingly focusing on edge and isolated cases, often only covering the narrative of that single incident. In other words, we have given up on providing real perspective and insight about the real world, in exchange for the quick fix of reporting about smaller stories that don't really mean much. I can prove this in a very simple way. Researchers at Georgia State University looked at how the media was covering extremism, and it found a really troubling trend (in the US). Of the 85 violent extremist incidents that resulted in death since September 12, 2001, far right wing violent extremist groups were responsible for 62 (73%) while radical Islamist violent extremists were responsible for 23 (27%). So, far right wing extremists commit considerable more harm than Muslims. We examined news coverage from LexisNexis Academic and CNN.com for all terrorist attacks in the United States between 2011 and 2015. Controlling for target type, fatalities, and being arrested, attacks by Muslim perpetrators received, on average, 449% more coverage than other attacks. Given the disproportionate quantity of news coverage for these attacks, it is no wonder that people are afraid of the Muslim terrorist. More representative media coverage could help to bring public perception of terrorism in line with reality. In other words, the media is skewing reality by a very wide margin. But it's worse than this, because it's also about how stories are created. Think about the story from my country. One article (the one in the middle) is the 'police report'. Here we can read about the incident. The fact that the kids were also asylum seekers is mentioned merely as a side note, and is not really relevant to the story (I'm surprised the police even revealed it). We also learn that it wasn't actually six kids who assaulted someone. Instead, the actual incident was much more minor. It was only 3 kids who had stopped a couple and demanded their watch. And when one of them refused, one kid hit him with a bottle. That's a very different story than six kids all assaulting someone. The other two articles are then follow-up stories where the journalist has reached out to very specific political parties for 'a comment'. One is for DF, which is our right wing party in Denmark, similar to UKIP in the UK. The other one is the largest political party, the Social Democrats, who over the past couple of years have realized that being intolerant of foreigners has allowed them to gain more votes. So, you see what has happened here? If the story had just been about 3 kids born in Denmark, the newspaper would only have published the police report itself, and some newspapers probably wouldn't have published it at all. Remember, the story isn't actually that big. But because it involved asylum seekers, the journalist went into scandal mode, and reached out to the political parties he knew would give them a juicy intolerant quote, allowing him to write 3 articles about this and to feature it on the front page. So, the newspaper isn't really trying to be racist as such, they are just looking to create scandals. But, because of this focus and the culture that exist in journalism, we end up reporting this story in such a way that it distorts reality and become racist in its narrative. And we see this everywhere. The culture of journalism and the workflows that we have, encourage and creates a racist editorial focus. This is not a good thing, because it means that we (the media) are the problem. We are the ones creating this narrative, by reaching out to politicians to get them involved in this. This is not something the politicians should look into in the first place. Politicians are not supposed to react to isolated police reports. They are supposed to look at the big picture and the general trends, and to define politics as a whole. But we, in the media, are forcing this to happen. We are the creators of this problem. Obviously, the populistic politicians love being a part of it too, because they can win votes and post about it on Facebook. But more often than not, it's us in the media who facilitate the initial push for the scandal to be created. And there is more, because we then see an equally big problem with the way this is covered. When you look at the twoarticles with comments from politicians, we see an incredibly one-sided narrative. Both stories are exclusively about what each politician stated, in which the journalist at no point question what they are saying, provide any perspective to the readers, fact-check any of the statements or anything else. In other words, both of these follow-up articles are 100% PR articles for the politicians. Friday night six young Moroccan boys aged 12 to 16 years attacked a couple of 19 and 24 outside Christiansborg. The six are all asylum seekers and charged with attempted robbery and aggravated assault. It's true that six were initially arrested, but we already know from the police report that only three was a part of the incident, of which only one person actually attacked someone, again, by hitting one person with a bottle. That paragraph in the newspaper is a deliberately misleading narrative. The journalist is choosing to pick out individual elements of the overall story to bring them back together for maximum scandalous effect. The result is a false narrative. Brutal assault. Young asylum seekers should not be running around at night. 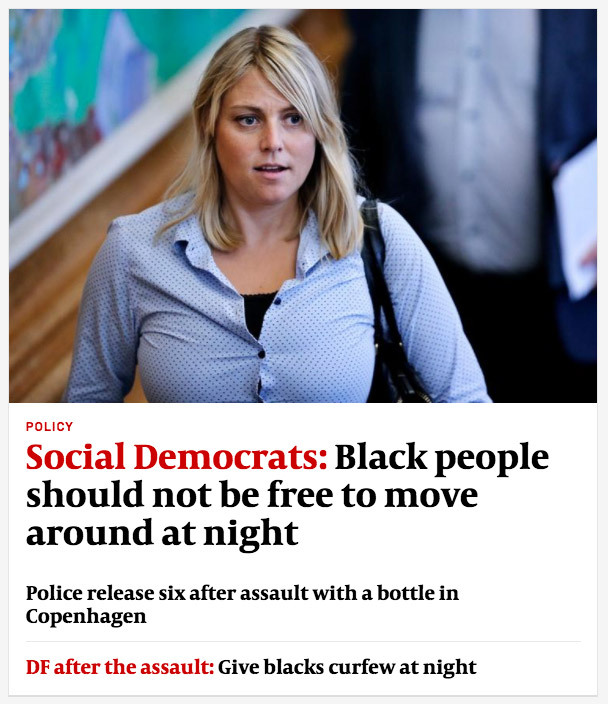 Støjberg [Minister of Immigration] must get a grip on them. No, it's not. That is as ridicules a statement as when white people in the US said that slavery protected black people from harm. It's 100% political spin. And the journalist decided to end that article with this statement, not questioning it, or asking how that a curfew could possible protect these kids. He points out that, last night, Copenhagen Police have arrested several asylum seekers for an exceptionally aggravated assault on a young couple in front of Christiansborg. This was not an exceptionally aggravated assault by several asylum seekers. This was one person hitting another person with a bottle. This journalist is helping this right-wing politician to directly mislead the public. And again, this article also ends with a political statement, which the journalist at no point question or fact check. Remember what I said before about the role of journalism. That it is, in part, to represent reality in our focus, to make sure people are aware of that reality once they have finished reading a story, and also to protect the public being mislead. This newspaper is not just failing at doing this. It's actually facilitating harm to the public perception. And it makes the newspaper racist. It's not (as far as I know) that any of the people working there is actually racist, but the culture of how journalists work, makes us racist in our narratives. 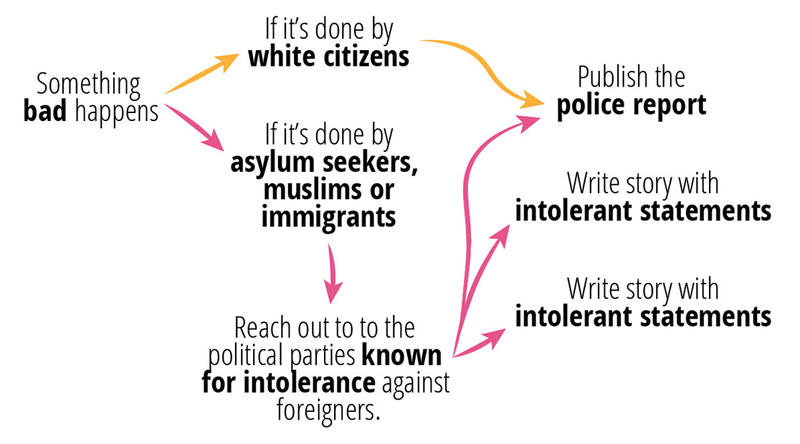 And again, this isn't just related to crime and immigration. This relates to every news story. 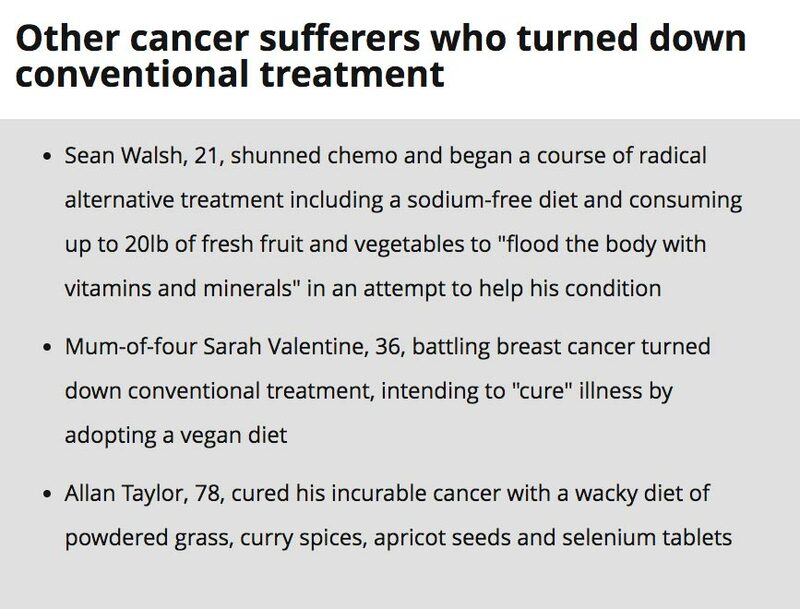 This is a story about a 38 year-old mother, diagnosed with breast cancer, who have decided to ignore her doctors and instead fix it by eating seaweed and pepper. This is just stupid, and, sadly, she will likely die because of her decision. But the journalist never really question this. Instead, the entire article is basically a point-on-point summary of why she thinks this is a good decision. Despite facing criticism from friends, Katie, from Dalbury Lees, Derbyshire, is satisfied with her decision. If I really believed that having the surgery would be my best chance of survival, I would have done it by now. I have a three-year-old girl and I want to see her grow up. This is the best option for me. And then The Daily Mirror 'helpfully' added a box featuring other people who have done the same, including mentioning one who were supposedly cured. This is irresponsible journalism in the extreme! 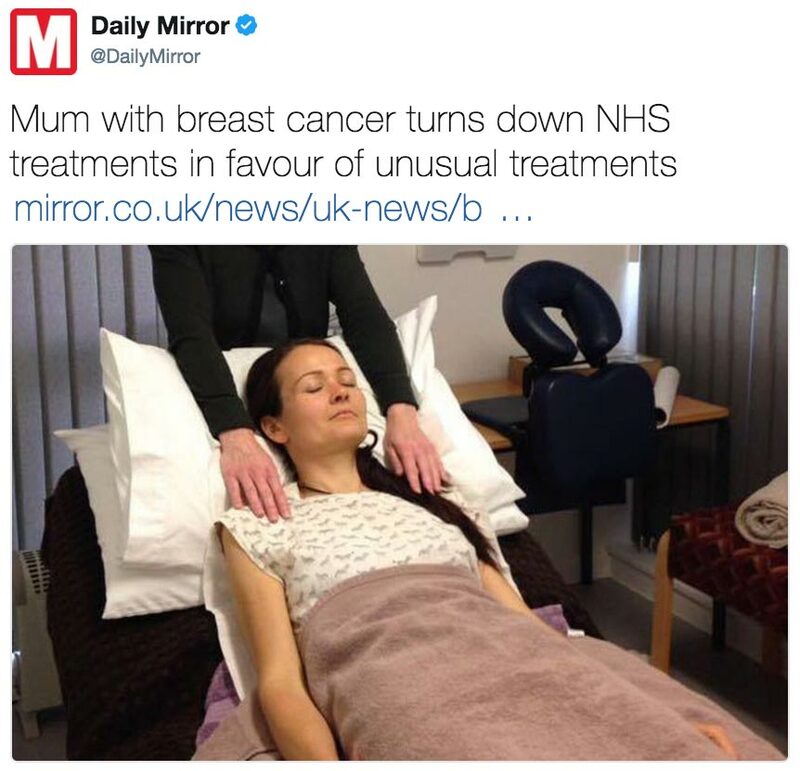 The Daily Mirror is actually presenting this as a viable option for breast cancer patients. This has to stop. This is not who we are. This is not what we should be known for. Mind you, I have no illusion that I can change the industry as a whole. In today's world with Fox News, Breitbart, Daily Mail and several others, we all know that many of these newspapers are never going to change because there is so much traffic and money to be made from intolerant and misleading news. What I hope to do with this article is to change the good newspapers. Politiken, the newspaper the first story was from, is actually one of the good newspapers. It has a lot of very talented and compassionate journalists (I know several of them). But the culture that exists in journalism is causing this newspaper to fall into the same trap as anyone else. Almost every single day, I see examples of this newspaper turned racist or intolerant. Not because it's trying to be that, but because its editorial focus makes them slip away from reality and into a world where the narrative misleads the public in racist ways. I can't help the bad news companies. They are lost causes. But I hope that, with this article, I can help all the good newspapers stay good. We need to differentiate us from the bad news sites. The way to win the future is to stand out from Fox News, Breitbart and Mail Online and be the voice of reality. When people use Facebook they will turn to whatever news story that sounds the most outrageous. Stories that polarize the public. But the good newspapers will win by becoming the place that people turn to (and subscribe to) when they want the real story. The stories that are always check-checked. The stories you know that you can trust. And the stories that take pride in representing the realities of the real world, rather than the noise of the moment. Today, most people can't tell the difference between these two, because there isn't much difference when you see stories like the ones above.